modeling the adult you want to see – Love. Life. Practice. 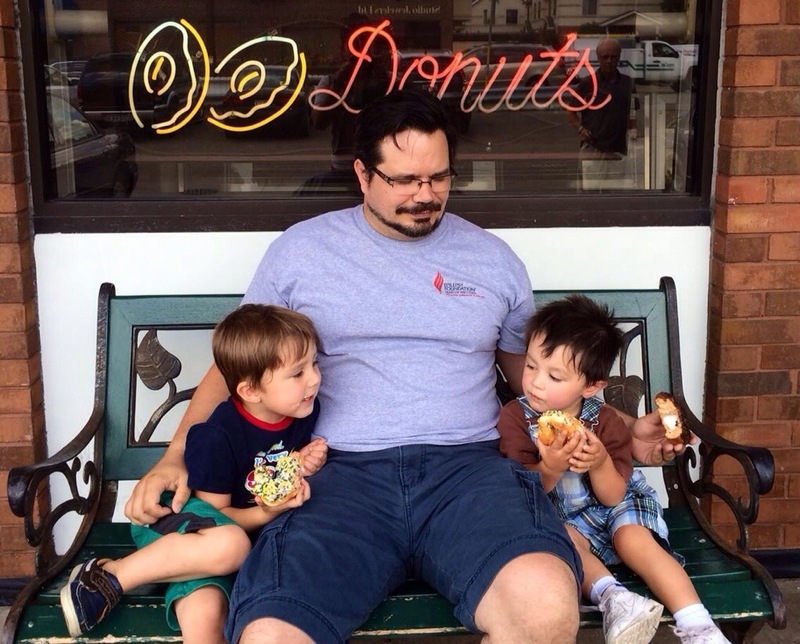 OK, I admit, that’s not necessarily the best role model up there – feeding donuts to my grandsons before lunch. However, they are Greenbay Packer donuts from the Greenbush Bakery in Madison, WI, so at least…um…they’re kosher? My grandson on the left there, Harvey, doesn’t have much contact with his father. That makes Father’s Day not a terribly enjoyable one for him. His mother, my Eldest Daughter, noticed that, and so she decided to create a different holiday. She called me and a few other men in her life – my father, her stepfather, a few friends from work – and invited them over for what she called “Great Men’s Day.” What she was looking for was for Harvey to get the idea that there are men in his life who care for him, and for him to spend some time with them. She had originally thought of having “Manly Contests” such as belching, meat eating, and…well, I don’t know exactly what, but I’m happy to say that she instead listened to Harvey and asked him what he wanted to do. Biologically speaking, there are a lot of traits that are different in men than women – but not as many as you’d expect. Men are not from Mars; Women are not from Venus. There aren’t “masculine” and “feminine” traits like sexual aggressiveness or bonding or cuddling or competition; there are simply traits that are influenced by levels of hormones such as testosterone and oxytocin, and both of those are present in various levels in every human being, from the raunchiest player to the most stoic asexual to the completely monogamous couple celebrating 50 years of marriage. It’s a beautiful spectrum. And I’m really happy that my daughter gets that, and she didn’t force any stereotypes or cultural memes on Harvey. When he said he didn’t want burping contests, she was ok with that; when he said he wanted music, she made sure there was some playing. Because of schedules, the men showed up in staggered groups. 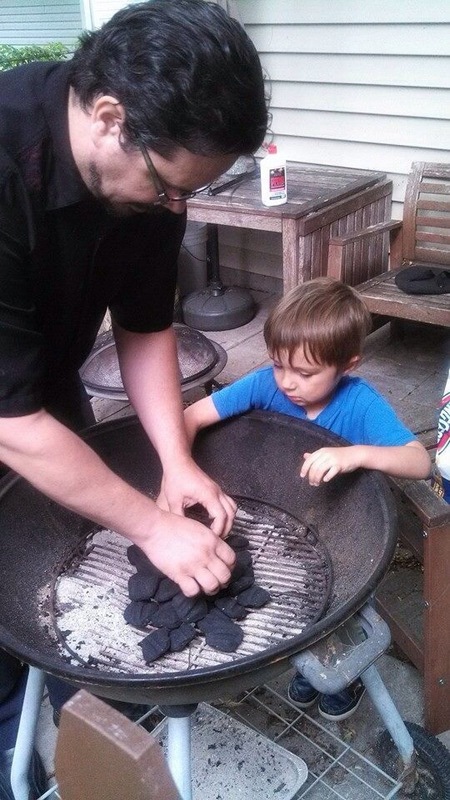 First my Dad, then myself, and we fired up the grill and told him stories about my Grandfather. The time when I rolled a toy right through a plate glass door. The time my Dad drove his car into a lake. The time he’d served in North Africa and Italy fixing bombers, reading papers by the fires of the burning wings (as he used to tell it). As the man sputtered “I DO understand! I DO!” I just shook my head and smiled. Harvey is turning into a wonderfully creative, sensitive, but also mischievous young man, and it’s because of the love that we share with him and he gives right back. I’m proud of my daughter for seeing the need and giving him what he needed, and proud of my Dad for dropping everything and showing up, and grateful to the other men for helping my grandson turn into one of the good men. Lord knows we need more of those.